Captain/Chief Officer James Dore of Sandown Fire Brigade passed away on 25 November 1925. What follows is his story which appeared in Ready When Wanted in a chapter dedicated to Captain Dore entitled The Light, with a few minor amendments made in deference to research discoveries that came later. With greater research the life of James Dore could justify a comprehensive biography in its own right and whereas my discovery of him came as a consequence of fire brigade research I was soon to discover that this individual was more than just a remarkable pioneer for the fire-fighting profession. I first located a reference to him when he was appointed Sandown Fire Brigade’s third captain in just over a year since the town’s brigade was first established in early 1879. 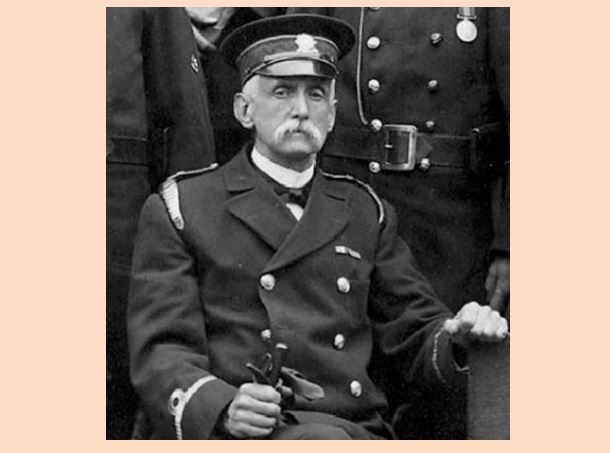 The original captain Frank Cantelo resigned on principle when his men weren't paid for attending a fire less than twelve months after the brigade was formed and his appointed successor Walter Jolliffe never actually accepted the position. Suffice to say by February 1880 Sandown Town Board were again seeking a leader for the fledgling brigade. Like Cantelo and Jolliffe, 26 year old James Dore, son of James senior and Harriet (nee Munt) was one of the originals that made up the Sandown brigade of ‘79. His appointment to Captain may have been an issue of perceptive genius as he possessed a leadership quality that earned him respect locally, nationally and internationally. Evidence exists that he was cherished by his men but it was his integrity as Captain and Chief of each and every fireman that ultimately led to his political betrayal and a sorrowful end to a extraordinary thirty-six years of commitment to fire-fighting. James Dore junior was born in Sandown in 1854. James senior was a baker who founded his business at 9 High Street; but it was not for this trade that his son was destined after his schooling at the Church schools in the Broadway. Dore served an apprenticeship with Mr F.G. Baker, watchmaker and jeweller, following which he left for London to gain further experience. Barely out of his teens he returned in 1874 and took over the business at 27 High Street and three years later established his household when he married Mr Baker’s sister Ellen. The business he gained was steady and flourished with two employees on the books. Whilst his business interests were of paramount importance his commitment to the fire brigade was unquestionable, stepping out whenever the call came day or night. Through the 1880’s he made several recommendations to the Town Board for improvements to the fire brigade and very nearly all were accepted, even where capital investment was required. In the face of some obstinate opposition he used his knowledge, reason and evident affability to win the day. In 1886 he recommended copper mesh be applied to the escape shute, this was granted and noted several months later for its effectiveness. In preparation for the warmer months he was granted the expense of hiring horses to take his men for a topographical tour of their rural extremities where a drill was carried out in preparation for the inevitable rick fires. Two fairly minor, yet in their way substantial, examples of things he achieved that other captain’s of the time couldn’t, or wouldn’t. The Isle of Wight County Press report of the brigade annual dinner of 20 April 1887 described Captain Dore as the energetic captain. His energy wasn’t restricted to his own brigade as he assisted his counterpart in Shanklin, Captain David Lloyd, in applying pressure on his Board to improve the fire-fighting facilities there and it was he that oversaw the training of Shanklin’s formalised brigade when it was established a few years after that of Sandown. On 24 July 1890, the evening of the Sandown carnival procession, Dore admitted later that for the first time he found his men insubordinate when they refused to form up for parade at the fire station, instead ignoring him and disappearing in to the Town Hall. Mystified by their behaviour he followed whereupon Mr Gerard Fox, Chairman of the Local Board, presented Dore with a handsome cross-belt bearing a silver plate with the inscription; Presented to Captain James Dore by the members of Sandown Fire Brigade in token of their respect and esteem. Following the cheers of the men Dore expressed surprise and appreciation. Three further cheers followed, Dore donned the cross-belt and all departed to fall in for the procession as ordered. By this stage in his life Dore’s growing passion for the art and technology of photography had seen him take prize medals at the Crystal Palace Photographic Exhibition, followed by similar honours around the country. In 1891 he patented an Improved Apparatus for Printing Lantern-slides from a Photograph of Like Negative and had placed advertisements in the Optical Magic Lantern Journal. An editorial in an edition of the same stated Mr Dore’s slides are noted for their excellence. Serving on the Works Committee of the District Council he played a leading role in the construction of the Esplanade and clearly took an interest in the 1891 discussions regarding the building of a dedicated fire station to better house the equipment and manual engine that were deteriorating needlessly in wooden sheds. In July of the same year he returned to the Crystal Palace with six of his men for the third annual meeting of the National Fire Brigades Union (NFBU). His apparent capacity for networking was limitless and on this occasion included a personal presentation to the German Emperor and an invite to inspect Southwark Bridge Fire Station as guest of Metropolitan Fire Brigade Chief Officer Eyre Massey Shaw. With a crop of his own photographs, inventions and a purpose built display stand to illuminate his glass lantern slides he crossed the Atlantic to display all in Chicago at the World’s Fair of 1893. Whether he was there at the moment of the immense conflagration that affected the Fair is unknown. His vigour enabled him to maintain various offices in the town in addition to being manager and member of the County Education Committee and Chairman of the committee that controlled the Mental Hospital at Whitecroft where his genuine care for the afflicted is evident in records of his action and involvement. His capacity to gather best practices from far and wide enabled him to evolve and maintain Sandown Fire Brigade as the progressive Island fire-fighting force and with money always an issue in its development he took his product to a wider customer base. In February of 1902 he took his men and engine to perform drills to a highly impressed set of onlookers in Bembridge and St Helens. Bembridge Parish Council was quick to respond with a request that Sandown Fire Brigade might be available to attend fires in the village. An arrangement was established based on communications provided by the Coastguard and finances were agreed; the deal remained in place for a number of years. In July of the same year the brigade again attended the NFBU competitions, this time in Margate and more networking paid dividends when Captain Dore and some of his men were entertained at the House of Commons just over a year later by Major Seely; the visit including tea on the terrace with Winston Churchill and special access to the gallery to hear the statesman in debate. Between all of this Dore’s business continued to grow, with the addition of a photographic department stocking plates, papers, cameras and other appliances and a well equipped workshop specialising in the repair and modification of virtually all known intricate apparatus of the period. He maintained his position on the Board and Committees to which he was committed and kept his brigade members keen with regular and often publicly viewed drill sessions; interspersed with occasional call-out where he took command of firemen engaged in battle with the real thing. In the summer of 1903 Dore attended the International Congress of Fire Brigades in France where he was again taken by surprise being the recipient of a tricolour ribbon medal that made him an honorary member of the Federation des Sapeurs-Pompiers Francais. In the December he took one of the first formal steps on the Island in the area of prevention of fires by impressing on his fellow councillors, when in the position of Chairman, the need to pay attention to the report issued by the Fire Prevention Congress. By now Dore had been granted an official capacity within the NFBU and was staff officer for the Crystal Palace meeting of 1904. When he attended with his men, coupled to that of Shanklin under their Chief Officer Oscar Rayner, the NFBU competitions of July 1906 at Guildford, he did so in the role of judge. On the Thursday afternoon of a thrilling week of fire-fighting he addressed two thousand local schoolchildren on matters of fire-fighting and fire prevention; finishing off with a presentation of the latest steam fire engine. Unsurprisingly the influential Captain had the Works Committee on side when in September he first recommended that Sandown take steps to acquire the Island’s first steam fire appliance. His recommendation won the committees approval and was taken forward. By October full council had voted in favour of his suggestion by 9 votes to 3. The wheels of bureaucracy ground too slowly for the Captain so in February of 1907 he persuaded Shand, Mason and Co. to lend him a steam fire-engine which he collected from Ryde pier and drove in to the town on a Saturday evening, coursing up the High Street with repeated signal blasts from a shrill whistle, according to the County Press. Four days later several hundreds of people gathered in front of the Sandown Hotel where the Shand, Mason and Co appliance under the guidance of the company’s Mr B.T. Whitehead was set aside the town’s ageing manual engine. Both old and new pumps were got to work and while the score or more men pulled at the pumping handles of the manual for all their life to charge and maintain a flow from a 5/8” nozzle, once the Shand Mason was up and steaming its 1” nozzle was throwing a jet far and beyond the reach of the former and at an impressive rate of up to 300 gallons per minute. According to the press of the day the demonstration was in every respect a success. For Dore it was a coup and the procurement of the brigade’s steamer was literally days in the making. Such was his enthusiasm and confidence that on 5 March he suggested to Council that the engine carry a brass plate on either side; on one being inscribed No 1 Sandown UDC and on the other the engine’s own name Primus in Vectis. Despite his success in so many aspects we can only wonder why at the end of the same month Dore failed to gain re-election to the office of the District Council he’d served continuously since 1894. Sandown’s County Press correspondent of the time reported in eulogistic terms the loss to the town will be felt more and more as the years go by. He continued; He it was who proposed that a loan should be taken up for the paving of the streets...the Fire Brigade-station and Local Board offices owed a great deal to Mr Dore’s energy and progressive spirit. The Esplanade scheme was doubtless the biggest job he took in hand...(his) foresight was also responsible in a large measure for the extensive works and improvements in the Lake ward of the district...the result being that property is more valuable than it was a few years ago. Concluding with Mr Dore has a lot of enemies in the town – who among our public men, who are worth their salt, have not some enemies? Whether some of those enemies had schemed his downfall isn’t proven but for sure and despite the essentially democratic nature of his removal, several other members had offered to resign their seat in protest that the town should not lose his services. For Dore’s part he remained enigmatic, stating only his continued commitment as chief of the fire brigade. Elsewhere his services remained of value, returning to adjudicate the 1908 NFBU competition in Scarborough and being made a member of the Federation des Sapeurs-Pompiers du Grand Duch of Luxembourg following attendance at the congress in August, one of seven delegates selected to represent the NFBU internationally. By March of the following year he was elected to the management committee of the NFBU Widows and Orphans Fund; a forerunner of today’s Firefighters Charity, and in 1910 he was appointed a Justice of the Peace for the Isle of Wight. In August 1911 he arranged a highly spectacular brigade display in and around the Ocean Hotel to raise funds for the Widows and Orphans. Accompanied by his deputy Dr Howard Barclay Billups, the men turned out a dazzling display of intensifying fire drills with the steamer. From a scaffold erected on the Esplanade his men willingly leapt to be caught by their comrades in sheets. A Pompier ladder, an idea Dore brought back from the continent, was put to use in addition to the double-line rescue system unseen before in this country. The finale involved the suspension of an old mattress, petrol soaked and fired about halfway up the scaffold and attacked to destruction with a variety of nozzles working from the thumping steam engine. Later the same month he was off to France again on behalf of the NFBU. This time he was awarded a further medal upgrading his status from honorary member to full member of the Federation des Sapeurs-Pompiers Francais. A short while after returning home he was caught in one of the most dramatic photographs of Island fire-fighting of the pre-WW1 period when the motorcycle and bicycle store in St John’s Road, owned by Frank Cantelo the original and short-lived captain of the brigade, was involved in a substantial fire. Friday 5 January 1912 saw the official opening of Sandown’s new fire station by Lord Alverstone. Accompanied by one Miss Webster the Lord approached the Town Hall between a double-line of the uniformed members of the fire brigade where he was received with hearty applause. Reforming within the hall, the brigade lined up across the stage and all stood for the National Anthem played by Miss Gertrude Langston and her orchestra. Captain Dore addressed the gathering reminding everyone that it was not so long that the very ground on which the Town Hall stood was little more than a village green where some of the more senior men under his command played as boys. Elaborating on the necessity of fire brigades and the need for up to date appliances the Captain refuted the claims of some that fire brigades only benefitted insurance companies; referring to the life saving aspect for which no insurance could account. Returning to Lord Alverstone the guest poured lavish praise on the brigade and in particular Captain Dore who he recalled many years before had taken great personal risk at a fire in Shanklin involving gun powder and partial building collapse; the success of the brigade was due to the force of good example set by James Dore. Later the same year Captain Dore’s influence stretched further as he was elected chairman of the Southern District of the NFBU. It was in that position that he welcomed the eleven NFBU Southern District finalists to the annual competition in Farnborough on Whit Monday of 1913. Dore’s training of his men shone through and despite sustaining a respectful impartiality during the event he would no doubt have shifted in his seat as his team ran a close second to Bournemouth in the manual pump competition. A year later at the same fixture, this time at Salisbury, he must have positively glowed as his men lifted three of the five event trophies on offer. It was a landmark moment both for Sandown and Isle of Wight fire-fighting and one which owed much to Dore’s progressive attitude to both the training and the welfare of his men. As the battle against the devouring enemy advanced under Dore’s command a new enemy was to surface and divert attention away from fire brigade development. In July of 1914 the First World War had opened and by August Captain Dore was already reporting to Council that certain brigade events had to be cancelled due to lack of manpower. The published report of the Council meeting of 12 January 1915 remarked on Dore’s speedy recruitment of Firemen Pressey and Stannard to replace the war bound T. Nash and S. Brown. A month later during an NFBU Southern District meeting in Bournemouth the pressures caused by loss of men at home forced Dore to withdraw from the chairmanship, his passing act being to cancel the annual competition scheduled for the spring, denying his depleted brigade the chance to defend their trio of crowns. Droves of men of fire-fighting age were drawn from the Island. Many of them, including some of Dore’s existing men, were both firemen and IW Rifles before the war. The Derby Scheme of autumn 1915 required the declaration of military service from every man between a certain age and not of a starred occupation (of which the fire brigade was not). Faced with the canvassers of the scheme, invariably staunch veteran soldiers or heckling society women, these men were not yet faced with conscription but when the scheme failed to deliver bodies at the rate they were being consumed on the front line, the Military Service Act was brought in to force and from 16 March 1916 gave rise and power to the Military Tribunals. Across the Island (as nationally) tribunals were held almost every day of the week in some corner of Vectis to hear the representations of those who couldn’t or wouldn’t join the fight. Every borough, urban and district council established its tribunal panel comprising local aristocracy, politician and the acerbic might of an ageing member of Army staff. Before them, largely alluded to in the local press as a miserable shower, those who offered their reasons for exclusion were generally subjected to vitriolic inquisitions. Exemptions were granted, usually temporary and with conditions. One of the most popular conditions being that despite the exemption being granted due to the man’s individual occupational importance on the home front, he was to commit fully to the needs of his local fire brigade. For the authorities it was a convenient way to wipe their hands of those they regarded as little more than cowards whilst appeasing the anxieties of brigade captains who remonstrated at the lack of hands to man their pumps. One of the early appearances at the Sandown Military Tribunal was made by Hedley Richard Brown. Brown, according to his records, was barely 18 years of age at the time and a conscientious objector. Offering no argument to avoid military service on the basis of a starred occupation, he instead stuck resolutely and unapologetically to his philanthropic and religious convictions. Brown was a fairly new member of the brigade and a member of a family that could be said to have provided the backbone of Sandown’s fire-fighting contingent of the era, his substantially elder brother Wilfred was later appointed Chief Officer. Hedley’s time as a fireman had barely begun when, on account of his youthfulness, he was hauled before the tribunal. Prior to this, and realising decimation of his brigade was imminent, Captain Dore had written to the tribunal expressing concern and making an appeal to; retain every one who was called up by the military authorities. Given Hedley’s reluctance it was therefore unsurprising that the tribunal were happy to appease Captain Dore’s needs and wash their hands of the troublesome theologian by returning him to brigade service. Throughout his previous thirty plus years service as head of the fire brigade, Dore’s compassion and understanding of his men is continually evidenced. He always strove to do the best for them, often placing himself above the parapet for their collective betterment. It’s therefore possible, but no more than the author’s conjecture, that his move to protect his brigade was both genuine pragmatism for the organisation, and benevolent protectionism of them as individuals. In this context it should be considered that Dore and his wife, for whatever reason, never produced a child of their own. Where else could a man of such immense integrity and honour devote his fatherly qualities than for the men he led in the brigade? On 11 May at a meeting of Sandown’s Urban District Council, the Works Committee, in possession of the knowledge regarding Brown’s stance at the tribunal, raised in forthright fashion their reactive proposition that he be sacked from the fire brigade as a coward. Chairman of the UDC, Sir Alexander Hosie M.A., LL.D., in the face of the spitting venomous co-reaction from other councillors around the table, asked if the dismissal of Fireman Brown had been made at the request of the Chief Officer of the brigade. The reply from Mr Attrill speaks for itself; All I can say is this. As an old fireman, I still have a few friends in the fire brigade and there is dissatisfaction. I am sure that if something is not done at once numbers of our very best firemen will cease to be members of the brigade. I have good authority – but perhaps I had better say no more. Hosie remarked on Attrill’s avoidance of the question asked, and asked again, this time in respect of Captain Dore’s involvement in the process. Attrill answered bluntly; No, none whatever. Amid what can be imagined a heated atmosphere, some members of the Council sided with the Chairman’s suggestion that the matter should be referred to Captain Dore as the appropriate chief of the brigade, but that didn’t bode well with the furious Mr Pitt; we are the bosses of the fire brigade! And of the town! And I shall stick to this resolution if all the fire brigade retire! Pitt then claimed that Captain Dore had sent a letter to the Tribunal asking them to excuse Hedley Richard Brown, which Pitt considered to be; an abominable disgrace. I am not going to knuckle down to anybody! Attrill similarly postured; these men were allowed to go about, grinning, laughing and smiling at others. If I have slighted Captain Dore... I am very sorry, but at the same time this has been brought about and I do not think he could vary the resolution. The proposition was taken to the vote, whilst the Chairman led the vote against the immediate dismissal of Brown, he had no option but to acquiesce to democracy and his amendment was defeated 6-4. Hedley Richard Brown was sacked by committee. A week later the Isle of Wight Chronicle dedicated substantial copy under the headline; Chief Officer Dore tender’s his resignation. The report revealed that Dore received news of Brown’s dismissal by memorandum. He replied in writing to the UDC; I much regret this action and had not the slightest knowledge of its contemplation until Monday evening prior to the Tuesday’s meeting of the Council. I pointed out to the Chairman that such a proceeding would be unjust, and could only mean that I was incompetent to continue to discharge the various duties of Chief of the Fire Brigade. Dore then elaborated with a number of points, summarised as; Fireman Hedley Richard Brown is the youngest and one of the smartest, most active and willing members of the brigade. He has always given satisfaction in the discharge of his duties. He holds the badge of the British Red Cross Society and volunteered for work abroad early in the War, but I would not agree to his going. This fireman has never received any support from me as a ‘conscientious objector’ and I have never written a letter ‘on his behalf’ to any Tribunal for this purpose. Realising some months since that no more able bodied firemen could be spared from the brigade, I, at a parade, gave notice that I should make an appeal to retain every one who was ‘called up’ by the Military Authorities. A letter was subsequently sent to the Local Tribunal to this effect, and it so happened that on account of age Fireman H.R. Brown was the first to be called. Apparently in the opinion of the Council this effort to keep the brigade together was an unpardonable offence. The Military Authority display much anxiety regarding the brigade, evidently considering it to be of national service and importance that efficiency should be maintained. I was always under the impression that fire brigade was work of National Service, and am still unconvinced that it is not. The Committee on Work of National Importance confirms this view, although to take men as suggested would be a great mistake. The Council, in summarily dismissing a most efficient fireman without a report or enquiry of any description evidently does not appreciate the seriousness of the situation from a fire brigade point of view. My only endeavour has been to carry out the duties of Chief Officer faithfully to all concerned, and I could have wished for a more fitting conclusion to my services than to find by the proceedings of the Council that I have failed in my effort. I have therefore no other course open and herewith accordingly tender my resignation as the Chief Officer of the Sandown Fire Brigade as from June 8th unless the Council decide on an earlier date. The Council discussed the matter, reaffirming their position regarding Brown and accepting, with regret, that this would remain the case even in the event of Captain Dore’s resignation. On 15 June the Council met for the second time since Dore’s resignation had been tendered. For the second time the meeting was thick with accusation and counter remarks and it was evidenced that an apology had been sent to Captain Dore, but not a reversal of the decision regarding Brown. On that date the UDC acknowledged receipt of Captain Dore’s fire station door key. Five years prior to these unsavoury events, in the winter of 1911, Dore’s long serving deputy (and eventual successor) Dr Howard Barclay Billups wrote a four part article describing Sandown Fire Brigade from its earliest days in 1879. Published over the course of four weeks in the IW Chronicle, Billups described his Chief Officer and it’s appropriate that a man who knew him so well and worked with him so closely should best illustrate the Captain. No account of the Sandown Fire Brigade would be complete without a few words about the Chief Officer, Ald. James Dore, J.P. to whom it might also be said, Sandown owes its present efficient fire brigade. For over thirty years Mr Dore has devoted untold thought and energy to the improvement of the brigade, and has never spared time or expense where it was concerned. The very honourable position which the brigade holds in the estimation of English firemen is largely due to its able chief. At the time of Dore’s resignation Dr Billups was serving in France with the Royal Army Medical Corps, but retained his position as deputy. However as the brigade remained leaderless Second Officer C.J. Dennett was ordered to assume the role following a decision in Council of 14 November. Dennett remained in post throughout the remainder of the war with Dr Billups writing to the Council in April of 1918 expressing his dissatisfaction with the state of the matter and providing a considered avenue of resolution. Mr Attrill asserted that the matter had been thoroughly thrashed out at the time and moved that no further action be taken except to forward a nice letter to Dr Billups acknowledging the trouble he had taken. When the war closed Dr Billups returned to the Island and to the brigade as deputy. Although there is little recorded, it wasn’t until June of the following year that he finally accepted the role of Chief Officer, and perhaps it’s significant that this was announced in Council on the same occasion that James Dore was offered, and accepted, the role of Honorary Chief Officer. One suspects that restoration of the dignity of Dore may have remained at the forefront of Dr Billups negotiations as Chief elect. Across the Island in the pre-Second World War fire brigades several men were appointed honorary members of brigades they had served in as younger men and most of them are reported as active within their brigades in this honorary capacity. No record has been unearthed to suggest that James Dore returned to any active role within Sandown Fire Brigade or the other fire service related organisations in which he was once so able, so progressive and so admired. James Dore passed away on 25 November 1925, at his home Fernside, Station Avenue, Sandown at the age of 71. The Isle of Wight County Press ran a near full column devoted to Dore’s life. Some highlights are detailed below. The Island has lost one of its best known public men and one who for nearly half a century has devoted much time and ability to the public welfare. In his public work Mr Dore was a man who, having carefully considered a question pursued a strong and definite line of action. It was a good thing in the interest of Sandown as a seaside resort, that he was Chairman of the Works Committee of the District Council at the time the proposal was advanced for the construction of the Esplanade. He took very active interest in this and in spite of most strenuous opposition, which lead to some amount of personal abuse; it was carried to a successful issue. Ald. Dore will be specially remembered for 21 years work as chairman of the committee controlling the Mental Hospital at Whitecroft. In this position his sympathetic nature found an outlet for practical expression. He had a genuine interest in the comfort and well being of the inmates and those who have been privileged to go through the institution with him were not slow to realise his kindliness was highly valued. For the high state of efficiency and the honours it has achieved in Southern District and national competitions the Sandown Fire Brigade is largely indebted to the keen interest and enthusiasm of Ald. Dore. By his death the Wesleyan Church has lost a most loyal member and a valued worker. One fact alone speaks eloquently in this respect. For the long period of 46 years right up to the time of his death he had been superintendant of the Sunday school, filling this position in a way that won for him the love and esteem of hundreds of children who passed under his care. It was not long before his last illness that one of his old boys – now the Mayor of Guildford – called upon him making himself known and expressing appreciation of the help he had received in his class during early days. Much sympathy is extended to the widow who has been in indifferent health for some years, and other relatives. There is no family. The IWCP also reported extensively on the occasion of his funeral three days later; Evidence of the wide scope of the public work of Ald. James Dore J.P. and of the many friendships he had made was seen in the large attendance at the funeral at Sandown on Saturday. In view of his keen interest in fire brigade work and his long and intimate association with the National Fire Brigades Association it was fitting that he should be laid to rest with all the honours that firemen accord their chiefs. In addition to members and honorary members of Sandown Fire Brigade there was quite a strong muster from other island brigades and as they followed the remains into the Wesleyan Church, where the first part of the service was held, the seating capacity became exhausted so that many of the general public had to go to the gallery. The Rev Arthur Triggs spoke; In the character of Mr Dore there was much that was Christ-like. He was a man who served to the utmost of his power and opportunity. Many knew that years ago his favourite hobby was photography and many were the exquisite pictures he had taken. They had beautiful pictures in their memories formed by the light that was in Mr Dore. He was a man of versatile powers and sympathies. The final mention in the report was that of Mrs Dore’s wish to express gratitude to the Sandown Fire Brigade and in particular to James Dore’s colleague and true friend Chief Officer Dr Howard Barclay Billups. From the perspective of the author James Dore’s discovery has been a source of wonder. Isle of Wight fire-fighting history is privileged to have in its perpetual possession a man of such integrity, dignity, drive and compassion. Having seen almost two hundred of his poignant photographs of Island life between 1890-1916 I live in hope that someone will see fit to access the near 600 of his glass lantern slides in the possession of the Council archives and publish them to ensure we too have beautiful pictures in our memories formed by the light that was in Captain James Dore.